A complex solution that would include backend, web and mobile elements. The project was 100% external, which meant an exceptionally close cooperation with the Helpling team. A wide range of functionalities, including search tools for both cleaners and homeowners, sign-up, account management, and secure payments. The platform should enable local cleaners to offer their services and handle secure payments while delivering an equally excellent experience to homeowners. Trust is key. 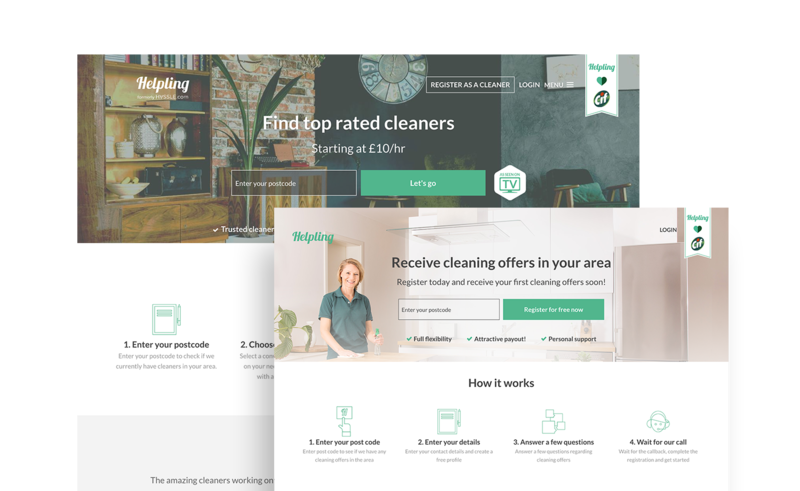 A platform for cleaners, with a sign-up functionality and a local cleaning opportunities search tool that would also handle payments. A platform for homeowners, with payments and a local search tool. Support of Netguru’s skilled Ruby on Rails specialists for the Helpling team. The product has been positively received by both customers and service providers. A well-established platform with market traction has been built. Netguru’s and Helpling’s teams have engaged in a long-term cooperation, which allows for a deep understanding of the product and enables Netguru to quickly respond to Helpling’s needs as they arise.